Wunjo is considered to be a positive rune and when drawn in the upright position will always represent joy and happiness coming into life. It is an excellent omen in a reading. A shift, that was due, has occurred and the blessings associated with Wunjo may freely be received and accepted. These blessings may relate to material gain, emotional life, or in a heightened sense of one’s own well-being. Be happy! In combination with other runes, it indicates success in whatever areas they rule. For example, with travel runes such as Raidho or Ehwaz, it can show a fortunate and generally pleasing journey; with message runes such as Ansuz, it can mean good news; when Wunjo is drawn with love related runes, in can show deep affection and long-lasting emotional happiness. Often, Wunjo will signify the object of one’s affections. In this case, it usually shows some activity undertaken with this person will end with a happy result. 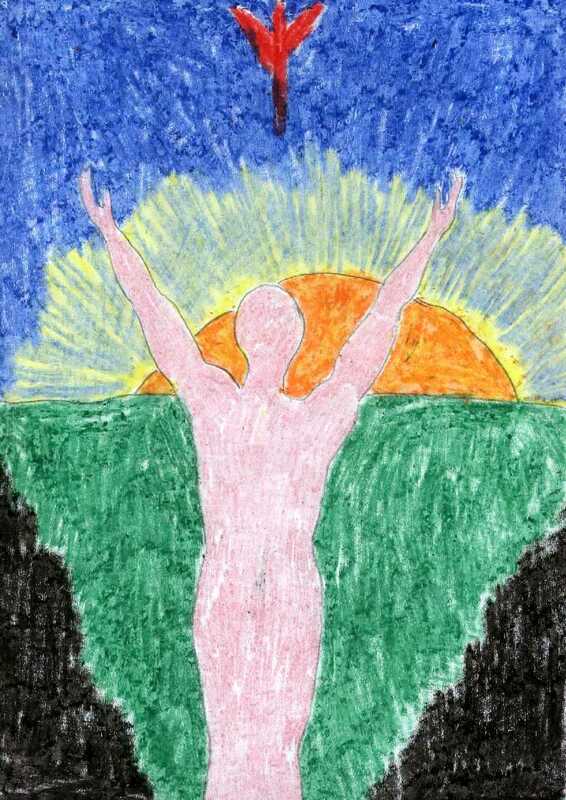 Wunjo can also represent joy in one’s work, especially if that work is artistic or creative . 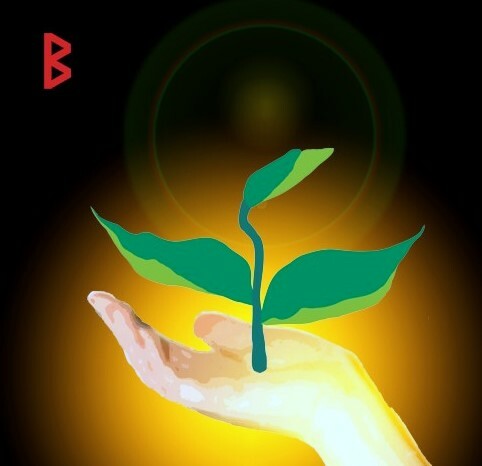 Like the rune Kenaz, Wunjo appears in readings for people who are artists or craftsmen and shows that this creative element is very important to their personal happiness and wellbeing. Reversed The meaning of Wunjo reversed is exactly the opposite of everything stated about its meaning in the upright position. Things are slow in coming and the person for whom the runes are being consulted may be undergoing a difficult, if not crisis time, filled with misery and unhappiness. The runes drawn in addition to Wunjo should show the specific problem areas. Drawn with Raidho or Ehwaz, an unsafe or unsuccessful trip with breakdowns and delays are indicated and are likely. If the question being asked relates to one’s employment, Wunjo reversed warns of dissatisfaction, either with the job itself or with one’s job performance. In matters of love, this rune shows disappointment or a delay of some type in a present relationship, the intensity of which can be discerned from the other runes drawn. In all questions about business, travel or love, Wunjo reversed shows a need for caution, perhaps even putting off an important decision until a seemingly better time. 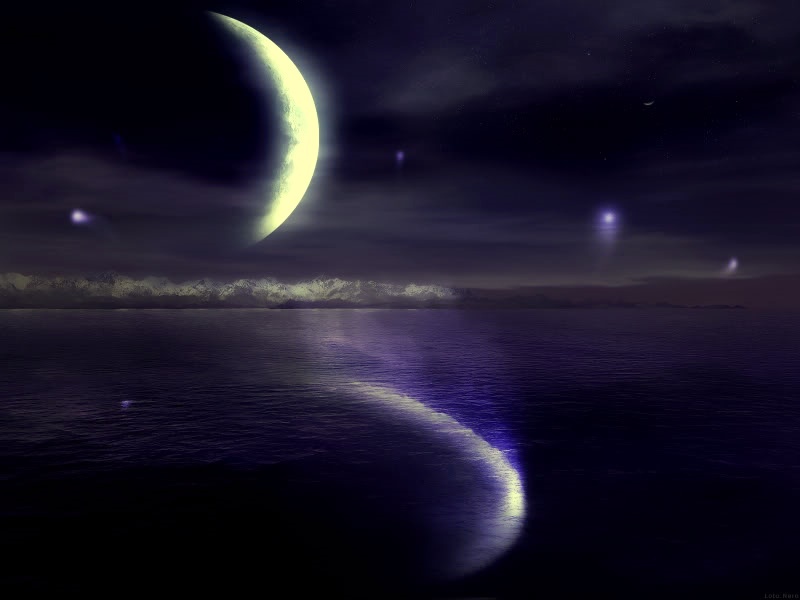 The rune of Wunjo can also show trouble caused by a third-party in the form of friction and delays. One should be on the lookout for any possible double-dealing on the part of acquaintances, friends, business associates or opponents. 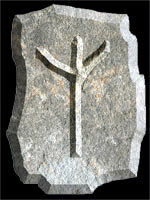 This rune is a fertility symbol, drawn to resemble a woman’s breasts. In ancient Viking times, the birch was regarded as the tree of fertility and the act of being lightly whipped with birch twigs was supposed to promulgate vigor and vitality! The people of Scandinavia still hold this belief; after a sauna people are encouraged to roll around in the snow and then made to endure a lashing with a bundle of birch twigs. The Phallic maypole that was traditionally danced around, heralding in Spring and new life, was usually made from birch. The appearance of Berkana in a reading clearly points toward inception; whether of a child, a project or perhaps a new idea. Berkana is rather auspicious. Yet because it represents the mother, and by implication the child, there is an element of “nourishment” associated with it. Even if the rune is essentially beneficial the new project will need the same kind of feeding or succour as an infant would. Success will not come on its own without some nurturing; effort and attention will be required. This may explain the duality associated with the birch tree, the “fruitless tree,” implying that all is not as it seems and that success will be achieved only through authentic and genuine application. Reversed, Berkana becomes a symbol of sterility, implying difficulties and miscommunication, especially on the domestic front. Perhaps a desired pregnancy will prove impossible, or a current pregnancy be terminated. Alternatively, Berkana can point to worries over children, especially in terms of health. The surrounding runes always point to a clearer picture. A reversed Berkana is not particularly malign of itself and requires more ruthless runes to imply any real trouble, while helpful runes definitely reduce the situation. Algiz literally means, “elk sedge,” which is a grass widely regarded as having properties of magical protection. This rune is like a protective charm and when Algiz appears in a reading the message is optimistic. Some say Algiz means “elk” while others insist on its meaning being “amber.” This symbol is not free from dispute; some note its outstretched arms, while others see an antler, and still others a staff. 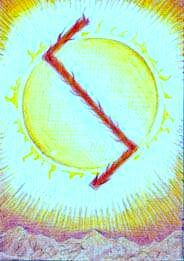 It is agreed however that this is a most favorable and beneficial rune, no matter what place it holds in the reading. Algiz signifies that one is shielded from danger or difficulty during the time span to which any questions apply. Algiz also signifies a new and beneficial influence is about to enter one’s life. This could take the form of a new career, interest, or even a forthcoming union. It is likely that this new influence will not arrive as a result of conscious reasoning or determination. This is most definitely a rune of friendship and protection but it is through ones inner self that this friendly influence is manifested; it is what is needed and deserved. When this rune appears reversed, it is expected that one will be duped. People in business or personal relationships have their own agenda’s and their goals will oppose those of the person for whom the runes are being consulted. Algiz reversed indicates that one needs to take great care and caution because others have only their own best interests in mind. One can expect others to do their best to make sure there will be unjust blame. To the ancient people, the wood from the yew was perhaps the most important. It fashioned the longbow, the weapon that brought food and, in times of war, protection as well. The yew was of tremendous practical value to its people and held a spiritual significance as a symbol of death and resurrection. Even today, yew can still be found in many church cemeteries. When this rune Eihwaz, appears in a runecast or reading, it may be taken as a very positive sign. It suggests that the person being read is close to their target and, with steady aim will achieve it before too long. Sometimes the appearance of Eihwaz can also signal delay. Either way, the outcome can be assuredly positive. On a spiritual level, Eihwaz represents the ability to put one’s inner self into stronger and safer territory. The yew tree is evergreen and extremely flexible, yet very strong and is an excellent source wood for making staffs which may in turn, be seen as symbols of inner strength. The yew tree in a churchyard exists symbolically to direct the souls on to the other side, revealing that Eihwaz has more than one side to its nature. “We’re like that!” is what we say when we are trying to communicate how close we are to another, and by crossing our fingers together. A union, signified by the cross has been used as a representation since ancient times and implies complete harmony. Gebo is associated with the planet Venus, the goddess of love. Whenever this rune is drawn for the person being read, know without a doubt that the person is bringing a matter of the heart. Gebo is a benevolent influence; however the surrounding runes show more and may even show difficulties in relationships. 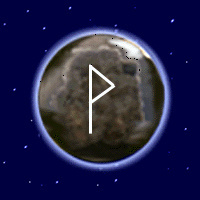 When this rune is drawn, the person for whom the reading is occurring is, or will soon be in a general state of relaxation and peace with themselves and the rest of the world. As a result, I recommend that one doesn’t consider the appearance of this rune to be entirely positive. The outcome may prove to be productive, but not, necessarily positive. Ignore one’s inherent responsibilities and the outcome could be perilous. Stars were circling, Leo passed through Gemini all of it making little sense. I heard the echo around me. Nothing is as it seems. I was alone then for others understood not my power. No. I knew not how to control it. So I alone brought my anger there. No one’s fear but mine was present. The Lightening lashed, screaming for the roar of thunder. Finally the battle was over. Gentle rain washed me clean of my hurt. So I knew peace for a while. I slept dreaming of the Gardens I was on my path to. I breathed deeply of his Aqua Velva cologne. Tasted the sweet Texas tea. And to begin a beautiful day. The Three Rune Spread does the job for all but the most demanding or challenging situations. With an issue clearly in mind, select three Runes, one at a time of course. Place them from right to left in the order each Rune was selected. So that one doesn’t make a conscious effort changing the direction of the stones, especially as one becomes familiar with the symbols, it is good practice to place each Rune blank side up, and the turn them over. With the selection complete, the Runes will be before you as in the diagram above. Reading from the right, the first Rune reveals the Situation; the second or center Rune identifies the Action; and the third Rune (the one on the left) indicates the New Situation. The way in which one happens to turn the Runes may have some effect and alter the direction of the symbols to either an upright or reversed position, but remember, this too is all part of the process. Since only nine Runes read the same upright and reversed, the readings for the remaining Runes will be determined on how the Runes have been placed or turned. From my journal I am able to recall the Runes I drew: Reading from the right, the first Rune was Algiz, the Rune of protection reversed addressed my sense of being totally vulnerable, and unprotected. This was the first time in my adult life I would really be on my own; without a partner. Only right action and correct conduct provide protection in a time such as I was facing. I would have to grow and learn from the loss of the relationship. The second Rune drawn was Kano, the Rune of opening. I was encouraged to trust the process and consider what aspects of my old conditioning would be best if changed. Third drawn was Nauthiz, the Rune of constraint and pain. The new growth would not free me from anguish over the situation. The end of that relationship caused me to begin on my path of personal growth. For the first time as an adult, I was working on me. I also came away from this reading knowing that I was being called upon to be mindful of the fact that rectification must come before progress. Though I was feeling vulnerable and “exposed,” I was made aware that with pain comes the necessary clarity to get on my path of personal growth and change. As I began to move along that path, I was often reminded to consider the positive uses of adversity. Above all, the runes are steeped in nature and symbolize the power exhibited by different elements of nature—the wind, the sun, ice and rain for example. Therefore it is impossible to understand the runes by adopting an intellectual approach. The peoples of northern Europe led lives that were extremely close to nature and dominated by these elemental forces. As in many other ancient cultures, nature and the gods were considered to be one and the same thing. Each god symbolized a different element of the natural world and was believed to be responsible for the creation and continuation of his or her natural phenomenon. For example, to the Germanic peoples, thunder was believed to be an action of the god Thor. This can be quite a hard concept for the modern mind that is trained in logical, empirical thing to grasp, but it is essential for understanding and using the runes effectively. 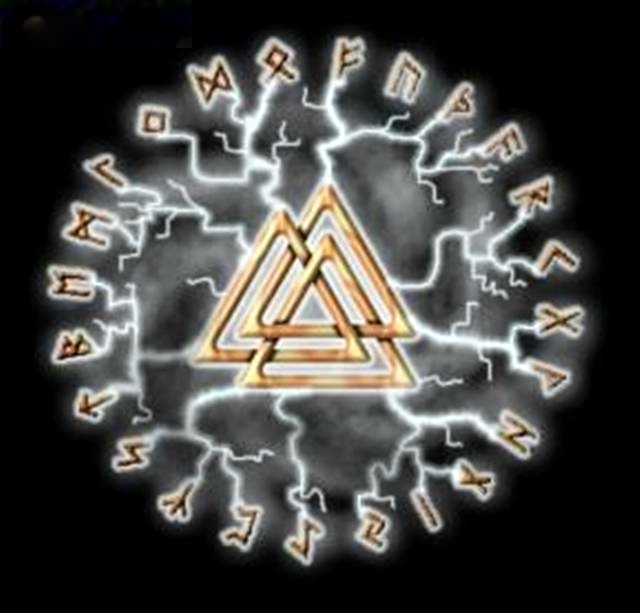 In ancient times, the runes, by symbolizing these elemental forces, allowed the user to make direct contact with the forces of nature, and thus perhaps to gain some insight into how the patterns of life were unfolding, so that they could take the necessary steps to ensure survival. Life at that time was an extremely tenuous affair, and natural forces could cause death and disaster to those who were unprepared. To a certain extent, this still holds true today, witness the large scale destruction caused by hurricane Katrina, but we have such a sophisticated social system that, to a great extent we are protected from the real chaos that nature can cause. Early peasant cultures were not; they were at nature’s mercy. One of the most important things to remember about the runes is that the wisdom which the tradition contained was handed down from one generation to another orally – largely in the form of poetry to make it easier to remember. In ancient times, this sort of knowledge was not considered to be for everyone’s eyes so it was never committed to writing. The shaman, who had been initiated into the knowledge of the runes, played a hugely important role in those times. He or she was the spiritual member of the community who gave each rune character its symbolic meaning and thereby it’s mystical power. The shaman was the most powerful figure in the tribal community as it was he, or she, who could determine and cure illness, foster fertility, ensure a good harvest, and solve many other concerns that were essential to everyday life, perhaps and most notably protecting the tribe from its enemies – both the human and the animal kind. For many cultures and many thousands of years, the shaman was the person who could bridge the gap between the world of the gods and that of ordinary humans and use their psychic ability to communicate with the sprit world. In that sense, they were conduits for nature itself, considering the gods and the elemental forces of nature as one and the same thing. In many parts of the world, shamans made a connection with the other world when they were in a trancelike state induced by drugs – especially those with hallucinogenic powers – or by dancing, fasting or conducting rituals. Shamans were an integral part of the culture of the runes, yet they were especially selected, trained, and set apart from other people in the community. Both physical and mental powers had to be well above average in order to perform many of the rites and ceremonies involved. Although revered for their knowledge, shamans also inspired considerable awe through their apparently supernatural powers. In many parts of the world shamanism still exists, and shamans still live in self-imposed isolation living on a separate plane, wrapped in their magical universe. It was not uncommon for shamans to be in some way physically impaired at a time when it was almost impossible for anyone else to be crippled or survive. For ordinary people, disability was socially unacceptable. On a practical level, it was almost certain to lead to an early death and there was no form of social welfare in existence to make life more manageable. If you could not hunt or gather crops for the community, you were an outcast. The only possible existence for a disabled person was to become a shaman – if he or she had the strength for such a demanding position. Even so, they would never be accepted into the day-to-day affairs of the community, regardless of their hugely influential role in community life. The role of shaman was kept in the family, passed down from generation to generation – from mother to daughter and from father to son. The runes are derived from natural forces, which the observant can see everywhere they look: in the shape of a stream as it flows through a field, at the point where the branch of a tree forks, or the random shape of stones on a beach. It is as if nature talks to us directly in the shapes of the runes. The knowledge they impart is also all around us, as long as we have the eyes to see and the mind to understand. The runes have no history of being used in fantastic or magical enterprises; their powers are grounded firmly in the natural world. They do not give political dominance or unearthly powers on the battlefield. Like nature itself, they are pragmatic and down to earth. To this day, our language has a number of little sayings that express the underlying philosophy of the runes – such as “nothing comes for free” and “what goes around comes around”. If a king wished to win a battle and gain more territory, this desire would bring greatly increased responsibilities; if a peasant wished for more cattle he would know that this would create considerably more work for him. The people who used runes realized that there is always a price to pay for any gain in life. Because of this they took a less demanding approach to life than many people do in today’s world.